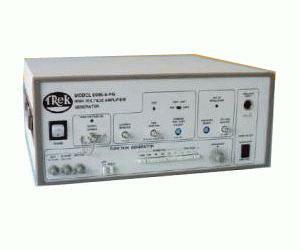 The Trek Model 609E-6-FG High-Voltage Function Generator is a combination of a high-voltage DC-stable power amplifier and a function generator. The high power amplifier is designed to provide precise control of bi-polar output voltages in the range of 0 to ±4 kV DC or peak AC with an output current capability of ±20 mA DC or peak AC. The function generator is capable of generating square, triangle, and sine waveforms in the frequency range of 0.2 Hz to 10 kHz. The 609E-6-FG features a switch selectable mode for current trip or current limit that is adjustable from 1 to 20 mA using the Current Trip/Limit Adjust potentiometer on the front panel. When the Model 609E-6-FG enters a current trip condition, the high-voltage output is disabled, the Trip Status indicator will illuminate and the Trip Monitor output will provide a TTL low. The Model 609E-6-FG is protected against over-voltage and over-current conditions that may be generated by active loads or by output short circuits to ground. Precision voltage and current monitors provide low-voltage output signals for monitoring purposes or for use as feedback signals in closed-loop control systems. This makes the 609E-6-FG suitable for automated or computer controlled systems. A Digital Enable feature provides a connection for a remote device to turn the high voltage on and off. The Model 609E-6-FG can be operated on a bench top or, with optional hardware, in a standard 19-inch rack.